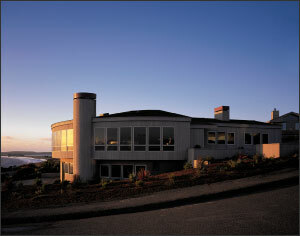 The large curve of this beach house follows the contours of the land and the curve of the street. Stepping the lower level reduces the bulk of the building. The curved chimney also softens the exterior. The landscaping features indigenous planting which is resistant to the local wildlife. The owner says quail and deer are frequent visitors, along with the occasional mountain lion. The great room, with its 35ft radius, spans out in a wide arc from the kitchen at right. The room faces the sun, but specially treated glass has been used to reduce the amount of glare and the damaging UV rays. The solarium is used as a breakfast area. It also serves to bring light into the kitchen, stairwell and gallery. 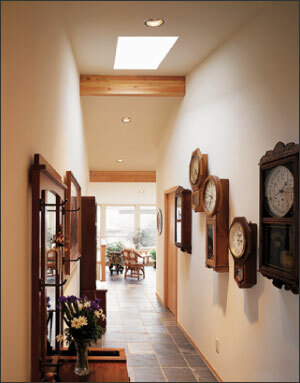 The passage leading to the solarium, or atrium, is designed as a gallery for the ownerís antique clock collection. Whichever way you look, the circular design allows the best views from the site. The main sitting area is centered in the great room, either side of the fireplace. The mantel is made from copper, and the hearth and fireplace surrounds feature slate. Recessed incandescent ceiling lights have dimmers for mood lighting. 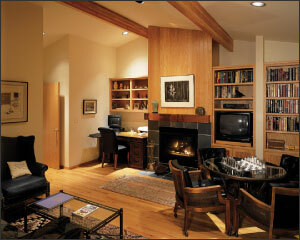 In contrast to the great room, the library is a cozy living space, which can be used as a fourth bedroom. The paneling above the fireplace is red oak. 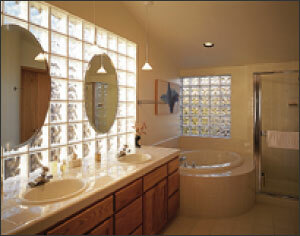 Glass blocks bring diffused light into the bathroom, which features a whirlpool jacuzzi. 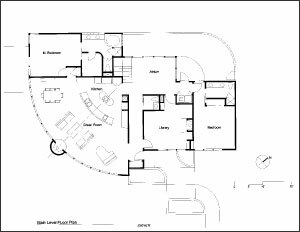 Architect David Kingwillís plan for the main floor highlights the quadrant shape which incorporates the great room. It may have the best view in the world, but that doesn't always mean a building site will suit the house you want. Building regulations and restrictions govern many subdivisions and often inhibit an architect's creative options. This beach house, however, proves that good design is still possible within strict parameters. Architect David Kingwill admits the biggest challenge in designing such a dramatic house was accommodating the building restrictions. These dictated the height of the house, the pitch of the roof and even the type and color of the cladding. "The sloping site helped the design," he says. "We were able to step the house down a level and gain extra space without affecting the roofline." The curved contours of the street were also turned to advantage. "Designing the house in a large quarter circle allowed us to follow the curve of the street and also make the most of the spectacular view," he says. "It's the main architectural concept for the house and a shape which creates the drama inside as well." To reduce the impact of the large building on the landscape, the lower level of the house is stepped back by several feet. The curved chimney is also designed to soften the exterior. "Planter boxes at the front of the house help avoid a flat plane, and lead the eye towards the entrance," says Kingwill. Inside, the curved shape opens up to reveal one large great room, which incorporates living, dining and kitchen areas, as well as a grand piano. "It's a perfect quadrant," says owner Elva Brinegar. "The shape allows for 60ft of windows and every room catches the view." While storms can be raging out in the bay, the great room creates its own warmth. Natural timber features extensively, with red oak flooring and paneling, and Douglas fir glue-laminated beams in the ceiling. together," says David Kingwill. "Copper is a very warm metal which suits the welcoming sense of retreat. The suspended soffit repeats the curve of the timber beam in the ceiling directly above, as well as the curve of the counter below. 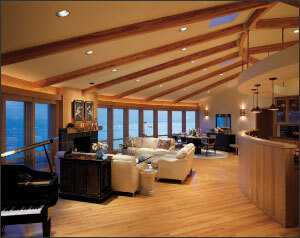 While the soffit supports hanging lights, it also has lights on top to throw indirect lighting towards the ceiling. 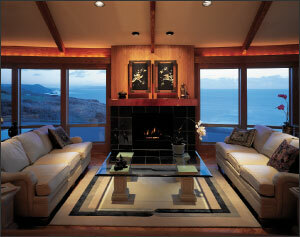 Light dimmers control the mood of the house at night. They also contribute to a sense of theatricality. "It's a house designed for entertaining," says the owner. "I love to cook and I love to take part in my own parties, so the kitchen is central to the layout of the great room." A separate library is designed for quieter moments. It also features the warm tones of red oak, leather, and copper over a fireplace. "I always like to have one intimate room," says Elva Brinegar, "which I can pull up around my ears, and retreat from the world." Other rooms on the main floor include the master bedroom, a second bedroom and an atrium, or solarium. This is reached by a passage, which is wider than usual to accommodate the owner's antique clock collection and furniture. 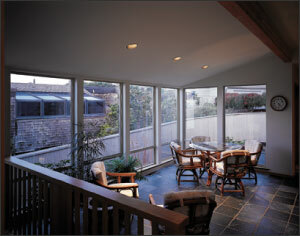 The solarium also allows more light into the kitchen, stairwell and gallery passage. Downstairs, the quadrant shape is repeated on a slightly smaller scale to provide a family and guest room. "Overall, the design works very well," says Elva Brinegar. "Despite the rigid rules governing the building of this house, David Kingwill has managed to capture exactly the feeling I wanted."